A Tinder-esque kingdom sim where you'll make a series of yes/no decisions in order to shape the future of your kingdom. Also, die a lot. Do I want to start planning the spring festival? Sorry, peons, we're a bit strapped for cash. (Swipe) Should I marry the queen in the kingdom neighboring ours? Sure, why not - we need the money. (Swipe) Time to go to war - you know, to shake things up. (Swipe) Oh, my scientist has a new invention for me (Swipe) and now the church hates me so much that they stage a coup and I leap from my balcony, dying instantly. Lovely. Time to start again. 15 years of fly-by-the-seat-of-my-pants rule, all in the span of about two minutes, undone in an instant. This is Reigns, and it stands tall among Threes and Device 6 as one of the best games the mobile platform has to offer. The comparisons to *ahem* dating apps like Tinder are obvious, but it's perhaps the easiest way to explain how everything works. You play as a king (one of many), and you have a series of advisors (represented by a stack of cards) who all come to you with messages explaining events happening in far off lands, a request to build some kind of civic work, or perhaps some devious scheme to fill the kingdom's coffers. You, as esteemed ruler of this fair land, decide whether to accept or deny their request by swiping their card to the right or left. Each card represents a year of rule, and each request brings another to take its place, and another, and another - not unlike swiping through images of potential companions on Tinder. While you're doing this, you have to keep track of four different meters represented at the top of the screen. Each one represents a different faction or concept - the church, the general populace, the military, and your finances/traders guild - and nearly every choice you make affects whether the meters grow or shrink. Favor a decision that allows the pope to have greater power, and you'll anger the military; raise taxes, and you'll piss off your subjects. Let any one of those meters empty completely - or, surprisingly, let them fill up to the brim - and you'll die in a handful of hilariously grim ways. Individual games are incredibly quick, which makes it great as a way to kill a few minutes while standing in line at Chipotle, but what takes it from a neat curiosity to must-play status is how it deals with time and permanence. See, as Reigns' monarch, you may have made a deal with the devil for immortality, but you never specified that you wanted to, uh, live forever. Technically, you're playing as individually different kings each time you die, but your 'consciousness' as the player remains the same throughout your kingdom's timeline, effectively transferring to each new ruler. So while you're likely to make a lot of the same stupid mistakes as your predecessors, hopefully you'll learn the effect of what each individual response does in order to maximize the length of your rule (which, if you're good, can last over a century). Your choices will also mold and shape the game for future runs. When you're going through a single reign, you'll see three different objectives available to complete - not unlike other mobile games. But instead of just giving you a handful of coins or experience points, each completed objective (which can be as obvious as "Rule for five years" or as oblique as "Invent modern politics") will often give you a new advisor to interact with, which adds a whole new set of cards, which means even more choices and scenarios get added to the pool. Finish an objective, and another one takes its place. You'll uncover a dungeon below your castle, hire a mad scientist that your church just positively loves, go on a crusade (which gives you a whole other set of cards to play with while you're there, steadily increases your profits and decreases your population even when you're not playing cards, and persists between monarchs), learn new combat moves - oh yeah, there's combat, entirely controlled through the same swipes, though it's a bit inscrutable until you get the hang of it - and so, so much more. Even certain items or abilities that you can find or build through event cards - like a set of ramparts that protects your military from taking a huge hit during attacks - will last between playthroughs. In most runs, you'll get a new tweak to your deck or surprising element to mess around with and figure out, and each run will take you one step closer to breaking the curse for good. Even though you have to effectively start over each time you die, individual runs are so quick that it's really hard to resist the urge to instantly start up another one just to see what else it's hiding behind that deck of cards. Reigns’ rogue-likey sense of progression gives you a reason to continue to return to it, to experiment, to continue to play to build and grow your kingdom. Its chirpy sound effects, stylistic visuals, and morbid sense of humor take care of the rest. 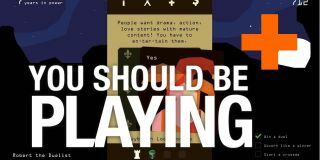 Reigns is a super tight little game that knows exactly what it wants to do and how to do it, and does so much within that framework that every single moment has purpose. I can't tell you how many times it left me staring at my screen, completely gobsmacked over the little tricks it pulls. It's $3. Buy it, and get to swiping.